Congratulations to both former Kelowna Rocket players for winning gold! Weber was named a tournament all-star while Keith had a hand on Canada's second goal. Missed opportunities, both on the power play and even strength, cost the Kelowna Rockets a win in Calgary Saturday night. The Rockets were 0 for 6 on the power play, including a 5 on 3 chance late in the first period, in a 2-1 road loss. Had the Rockets scored a goal with Cody Sylvester and Giffen Nyren in the box for tripping, it would have gone a long way in an attempt of knocking off a team that has lost just 8 times on home ice this season. With the game less than three minutes old, forward Tyler Matheson squares off and fights Hitmen enforcer Rigby Burgart. A draw in my books, the fight was a good sign by Matheson, who had been a healthy scratch the past two games. I think what it showed his teammates was as important as what it showed him. Matheson can contribute, and it showed his teammates that if he’s pulling on the rope for the greater good of the team, so should I. Matheson’s early bout provided energy for the team and that shouldn’t be overlooked. The goaltenders in this game were solid. I have to talk about Adam Brown again for his strong play. So many solid stops stand out, but the glove hand save off of Hitmen’s leading point getter Brandon Kozun in the second period just shows you what kind of zone Brown is in right now. Kozun finds a lane to the net and has a clear one-on-one chance between the hash marks with Brown. Kozun fires a wrist shot to the glove hand corner of Brown, who calmly makes the save. Brown was also force to make a breakaway save off of Joel Broda during a second period power play. I was interested to see who would start in goal against the Hitmen considering the Rockets were playing in Calgary for the first time since last years WHL championship series. While Mark Guggenberger, the star in last year’s series against the Hitmen, would appear to be the choice, the coaching staff went with the right move by playing Brown. You can’t tell me Brown is not playing the best hockey of his career. He is making some unbelievable stops, but more importantly is not allowing soft goals. Martin Jones was also steady in the Hitmen net. Jones’ save off of Evan Bloodoff on a second period breakaway was impressive. Bloodoff’s low blocker side wrist shot was perfectly placed, as was Jones blocked, which directed the puck into the corner. Rockets rookie forward Jesse Astles found himself involved in a third period fight with Hitmen forward Cody Beach. It marked the second time this season Astles has been involved in a fight with the member of the Beach family. He fought Spokane forward Kyle Beach earlier this season. Speaking of Astles, this road trip showed me some positive signs in his development. I think he is a lot more skilled than he is given credit for. The 16 year-old made some nice passes over the past two games to create scoring chances for his teammates and rang one off the goal post Friday night in Edmonton. The loss keeps them in 6th place in the Western Conference, but now in a tie with Kamloops. The Blazers were a 6-3 winner Saturday night in Medicine Hat. Once again I thought this was a gutsy effort by a Rockets team that played their 6th game in 9 nights. Outside of a few veterans, this was a solid team effort against a very good Calgary team. My sense is the guys love playing in that building, and for the most part it showed Saturday night. The Rockets have six games left in the regular season, four of which are on home ice. 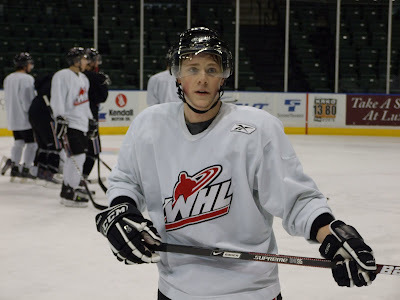 Be sure to check out the WHL website later this week as the league does a video on Rockets forward Shane McColgan. McColgan is interviewed along with assistant coach Ryan Cuthbert. I even had a chance to throw in my two cents on this dynamic 16 year-old's rookie season. Best public address announcer in the Eastern Conference? The dude in Calgary is solid. I like his style. Excited when the Hitmen score but not over the top crazy. Plus when he announces the Rockets goals, it doesn’t sound like he wants to commit suicide. It took them five tries, but the Kelowna Rockets finally have their 30th win of the season. The Rockets snapped a five game losing streak Friday night with a 4-0 win in Edmonton. It marks the 15th time in franchise history the team has recorded 30 or more wins. Lucas Bloodoff led the way with 1+1=2. It was Bloodoff's 7th multi point game this season. Bloodoff's goal came on the power play, snapping a 0 for 14 slump with the extra man. While the Rockets are 1 for 8 with the extra man, the goal was large considering up to that point they had dominated play and hadn't allowed a shot on goal in the first 9 minutes of the game. That said, the Rockets were awarded two-five on three's and were unable to convert. The game should have been over in the second period, not the third, when the Rockets scored two late goals. The Rockets fired a season high 53 shots at the Oil Kings net. Lucas Bloodoff may have had seven of them? I have said this before, and I will say it again, I wish the WHL will adopt a similar stat on the game sheet that you see in the QMJHL. The on-line scoring shows how many goals, assists, points and penalty minutes a player received, plus the number of shots he took on goal. The Rockets could have had 60 shots on goal against the Oil Kings yet many were blocked, especially point shots taken by d-men Dallas Jackson and Tyson Barrie. He's in a zone. Adam Brown was again sharp and was full marks for his 5th shutout of the season. While not overly busy, it's those timely saves that are oh so crucial. Brown made some big stops including a point blank chance from 16 year-old Chris St. Croix in the second period. Brown also had a nice breakaway save off of Cameron Maclise in the third period when the Rockets were on the power play. Max Adolph got a monkey off his back Friday night with a second period goal. It was Adolph's first goal in 30 games. I guess the knee is feeling alright? Evan Bloodoff, in only his second game back after knee surgery, was involved in a third period fight with 16 year-old Klarc Wilson. Give Wilson the decision, but to see Bloodoff engage in a fight tells me the knee is feeling pretty good. Evan Bloodoff scored his first goal of the season Friday night. It was his first goal since game two of last seasons WHL final when he scored once and added two assists in a 5-2 win over the Hitmen. My error. I failed to mention Evan Bloodoff played in his 200th career game Wednesday in Lethbridge. My bad. Torrie Jung watched his final game ever against his old team where he saw the previous two meetings this season....on the bench. Jung was the back up in all three games in the seasonal series. It almost looked odd from the broadcast booth as the goaltenders on both benches were twenty year-old's. While paid attendance at Friday's game was over 4 thousand, it appeared to be another smallish crowd as people stayed home to watch the Canada/Slovakia game. Once the Olympics are over, it will be interesting to see how the WHL was affected at the turnstiles. It's been a tough year for the WHL when it comes to attendance in some centres. First the economy was to blame, then the World Juniors kept people away, and now the Olympics had people staying at home. Jim Henderson. The name may not mean much to you, but Henderson spent 30 years in the Western Hockey League in various capacities with the Seattle Thunderbirds and Swift Current Broncos. I ran into Henderson in the media lounge at Friday's game. No longer holding an official title with a WHL team, Henderson is helping out the Oil Kings as a volunteer. He still loves to be at the rink, where he watches close to every Oil King home game. I had the pleasure of getting to know Henderson when he was the director of player personnel with the Swift Current Broncos. I only had a brief conversation with him, but it was good to see a smile on the face of injured forward Cody Chikie. Chikie met his teammates after the game and will rejoin the Rockets when he flies back to Kelowna on Sunday. Chikie is out of the lineup with a broken collarbone suffered against Calgary just a week ago. Maybe the Rockets will want to play more games in Edmonton next season. They have not allowed a goal in two appearances in Edmonton since the Oil Kings came into existence. Good morning from Calgary. The Rockets continue a five game road trip tonight with a 3 hour drive north to Edmonton. The Oil Kings and Rockets are meeting for the third time this season, with the Rockets winning both games, one by just a single goal. These two teams last met in early February with the Rockets using a shootout in a 5-4 win. Veteran forward Geordie Wudrick should be excited to play against the Oil Kings tonight. Wudrick has been named the games first star in the previous two meetings. The reason? Wudrick has two-two goal games against the Oil Kings this season. Speaking of Wudrick, did you know he is 4 for 4 in shootouts this season. The 19 year-old is money in the bank when it comes to one-on-one situations with the goaltender. Tyson Barrie and Shane McColgan have each received the most chances in the shootout, having been selected 8 times. Barrie has scored twice on 8 chances for a success rate of 25 percent while McColgan has also scored two goals on eight tries. Outside of Wudrick, Barrie and McColgan, the only other player to score a shootout goal is Cody Chikie. Overall the Rockets have been involved in 9 shootout games this season. The Rockets have not scored a power play goal in their last four games. The Rockets are 0 for 14 over that period. The Rockets face an Oil Kings team that is riding a season high four game winning streak. If you think tonight's game against this non-playoff team is going to be easy, think again. It's not often two WHL teams meet that have a 16 year-old rookie leading their team in scoring. That's the case as Shane McColgan brings his 64 points into tonight's game against Michael St. Croix, who has 39 points in his first year in the WHL. St. Croix has 12 points (5+7=12 ) in the month of February. McColgan has 3+4=7 during the month. Brandon McMillan is the hottest Rocket when it comes to offensive production in February. McMillan has 10 points in 8 games during the month. McMcMillan lead the team with eight assists during the month. Geordie Wudrick leads the team in goals with six in February and has 8 points. Shane McColgan and Brett Bulmer are third when it comes to top performers during the month. McColgan has 3+4=7 while Bulmer has 1+6=7. Tyson Barrie has 3+3=6. Mitchell Callahan has 2+2=4 in 10 games in February. It's only by coincidence, but it's interesting to see that the Rockets have given up exactly three goals in each of their last four road games. Score more than three and you win. They did against Kamloops February 12th and won 5-3. This statistic snuck up on me. The Rockets have allowed 20 goals in their last nine road game. The team is allowing on average just 2.2 goals against over those nine games. Impressive to say the least. Get ready to hand out the Gravol. When the Rockets return to Kelowna early Sunday morning, they will have traveled 3,912 kilometers over the last nine days. What does over 39 hundred kilometers mean? It's like the Rockets busing from Kelowna to Ottawa, Ontario. The mileage there (according to google map) is 4,081 kilometers. The Rockets are just shy of that. Oh, yes! 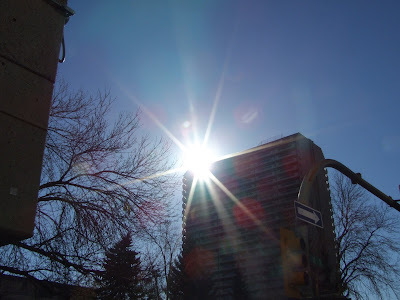 The sun was shining brightly in downtown Calgary this morning as the Rockets awoke following a 3-2 shootout loss in Lethbridge last night. It's amazing what a good night's sleep will do for your attitude when looking at last night's game. Do I feel good about the result? No. It's really tough to see this team lose back-to-back games against non-playoff teams, and they face that same scenario tomorrow night when they visit the Oil Kings in Edmonton. I know it's possible to lose to any team in this great league of ours if you don't bring it to the rink, but it shouldn't happen at this time of the season. The Rockets should be peaking with 8 games left to go, not marred in a 5 game losing streak. The line of Mitchell Callahan, Evan Bloodoff and Brett Bulmer didn't explode in last night's loss, but it will take time for these three to come together. You can't have one player who is in your face, another who can skate with the best of them and a playmaker/goal scorer like Bulmer, not to have success. Give this line a few games and you would see this trio becoming a threat on every shift. After reviewing the game tying goal late in the third period, Geordie Wudrick indeed scored the goal. It was originally given to Mitchell Callahan, but clearly Wudrick rifles the puck into the back of the net. Brandon McMillan feeds the puck in front of the Hurricanes goal where Wudrick one-times it thanks to his left handed shot. For Wudrick it was his second of game and 23rd of the season. I too thought it was Callahan, as the play happened so quickly. It's an off day for the hockey club in Calgary, so its a chance to recharge the batteries. Face it, February is a tough grind. Since the turn of the calender the Rockets have played 10 games in 21 days. It will be 12 games in 24 days when it's all said and done. On a non-hockey note, how can I not cheer for the Canadian women's curling team. When the lead is Cori Bartel, I have no choice! She is pictured to the right. Enjoy your day. I plan to do the same. Adam Brown was ready to play Wednesday night against the Lethbridge Hurricanes. His teammates, not so much. Brown deserved better as the Kelowna Rockets fell 3-2 in a shootout to the playoff-less Lethbridge Hurricanes. The Rockets had to have Brown on the bench just to send the game into overtime, where Mitchell Callahan scored his 20th of the season with the extra attacker. The point keeps the Rockets in a tie with Chilliwack for 6th place in the Western Conference. The Bruins beat the Raiders in Prince Albert by a 3-2 score. The Rockets dominated play in the final minutes of the game when desperation was clearly evident in their game. But it has me scratching my head as to why that desperate play wasn't evident through the first 58 minutes. Brown didn't receive a three-star consideration on the ice, but he was the best player on it. The Rockets goaltender was the better of the two goaltenders through 58 minutes until Hurricanes goaltender Linden Rowat got his chance to shine with his team pinned deep in their end. Rowat was very good down the stretch and was clearly a game star without question, but Brown's omission as a star has me scratching my head...again! The best Hurricane outside of Rowat was indeed Austin Fyten. Not a flashy player, Fyten worked his tail off for every thing he created and appears to have good chemistry with Cam Braes. Fyten did all he could in regulation time and then scored a goal for his team in the shootout. Fyten led by example and his team followed. The urgency on the power play. I'm scratching my head to know where it went. During a nine game winning streak, the power play was the bread and butter. In the second period alone the team gave up two-two on ones and didn't seem at all interested in going to the net for rebounds. Last time I checked that's the area where the majority of goals are scored. It takes a little more work, but that's where teams go when they are struggling in the offensive zone. The Rockets have just 6 goals in their last four games (1.5 goals per game). If the Rockets cut their shot total in half and fired more pucks from five feet in front of the goaltender I'd be impressed. Instead a 37 shot performance Wednesday night didn't impress me as much as it should. The Rockets should have gotten an emotional boost from the return of veteran Evan Bloodoff and Dallas Jackson. Bloodoff played his first game this season after missing the first 63 after undergoing knee surgery while Jackson was back in the lineup after missing 8 games with a hip injury. If the team received an emotional boost, I didn't see it from where I was sitting. I was excited to have these two players back in the lineup. Sorry for being so enthused. A lack of success scoring goals early is often this teams demise. Early struggles often times follow sluggish play. The team has to fight through that mental barrier that if success doesn't come quickly you must battle that much harder to right the ship. In the Rockets last four games, who has been involved in fights? All rookies. Max Adolph against Calgary, Brett Bulmer against Portland and Mitchell Chapman in Seattle. All are 17 or younger. Is it only coincidence that in an emotional 5-3 win in Kamloops earlier this month, Mitchell Callahan, Lucas Bloodoff, Brett Bulmer, Colton Jobke and Spencer Main all were involved in fights? It would have to be one of the top five games the Rockets have played this season. Why? One word. Emotion. The Rockets have now played in 28-one goal games this season. The Hurricanes can do one better. They've played in 29. Am I coming across to negatively? Maybe. I am writing this in the dark of the night as we head back to Calgary. Maybe I could spin off a positive tune if I slept it off and shared my thoughts Thursday morning. I would, but I'll be too busy scratching my head trying to figure out this team. 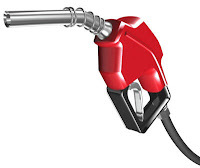 On our travel down to Lethbridge today we go through one community where unleaded gasoline is going for 84.6 cents a litre. Yet in Kelowna we now pay 106.9 cents. What's wrong with this picture. Evan Bloodoff is expected to play for the Rockets for the first time since the Memorial Cup final last season. Evan Bloodoff has missed the teams first 63 games after undergoing knee surgery. Bloodoff is expected to play on a line with older brother Lucas and teammate Mitchell Callahan. Assistant coach Dan Lambert spends some time on the bus looking over video with d-man Colton Jobke. 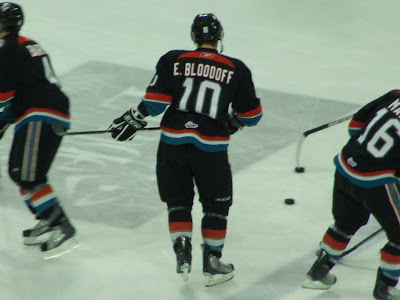 Nineteen year-old forward Evan Bloodoff is expected to make his 2009-2010 debut tomorrow night in Lethbridge. Having undergone knee surgery this fall, Bloodoff is expected to receive spot duty in Wednesday’s game. But like a race horse, the coaches will be hard pressed to pull back the reins on the speedy forward, who has just one gear. Outside of Brandon McMillan, no one has better speed on this team than Evan Bloodoff. Dallas Jackson could also return to the lineup against the Hurricanes. The 20 year-old is an impact player and makes this team a whole lot better at both ends of the ice. His absence has not gone unnoticed. Who starts in goal Wednesday night? I like both Adam Brown and Mark Guggenberger’s game right now. That said, I want to see it continue down the stretch and be difference makers. In some cases if they want to steal a game, I'll let them. While the Rockets spend the majority of the day traveling to Calgary, it doesn’t mean the team will miss the Canada-Germany men’s hockey game. Satellite TV is a wonderful thing on the bus. I hope to run into Cody Chikie when the team makes a stop in Edmonton Friday night. Chikie is recovering at home after breaking his collarbone against Calgary. Chikie is from nearby St. Albert. 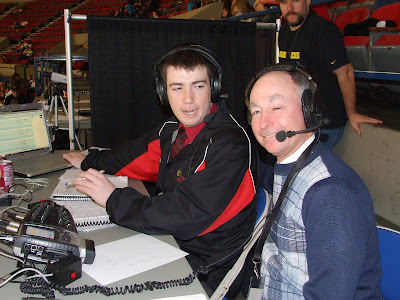 I had the pleasure of being on CJOC radio’s Lethbridge Hurricanes hockey show last night with Pat Siedlecki. It was tough to concentrate though, as my attention was being diverted after my son stepped on a nail 20 minutes before I was suppose to join the show. With my cell phone in hand, I took my son to the walk-in clinic and conducted the interview while trying to answer questions from the doctor. I am not a good multi-tasker, so I am not exactly sure what I said in the interview. If I used the word ‘tetanus shot’ when describing Tyson Barrie’s success on the power play, you’ll have to forgive me. I can’t count the number of times radio broadcasters from other teams have told me what a pleasure it was to interview Rockets head coach Ryan Huska. Not all, but some coaches are not exactly fun to interview. Giving little detail, being short winded and providing little small talk before the interview starts is a sure sign the coach would rather pick the lint off his pants than chat for four minutes. Huska isn’t one of those coaches, and if he indeed is, it doesn’t show. I have the pleasure of being around this coach all season long. It’s something I don’t take for granted. One of assistant coach Ryan Cuthbert’s many tasks with the team is organizing meals and accommodations on the road. Cuthbert has done a great job of ‘changing it up’ when required. Sure, we have the main dishes of chicken and pasta before games, but Cuthbert is willing to mix it up to put a smile on the face of the players, coaches and the radio guy. Fajita’s on the road on an off day or after a game is never a bad choice. Cuthbert gets it. Being a player not far removed from the game, 'Cutter' knows what the boys like. Hotel availability, or in this case a lack-there-of, in Lethbridge has the Rockets basing out of Calgary over the next four nights. In makes sense regardless, as it allows the players the luxury of staying in one hotel while playing three games in four nights. Once you arrive in Calgary, the travel is easy. A two hour trip to Lethbridge and a 3 hour trip to Edmonton Friday night is a breeze. The Rockets face the Hitmen Saturday night. You have to love Portland’s game night presentation. Outside of the teams play, the organization is giving good reason for sports fans to attend home games. Once you get past the look inside Memorial Coliseum, the cheerleaders and the roving microphone in the stands with a caffeinated hopped up host make the games a fun place to be. It’s all about selling the game to the crowd, whether they are die hard fans or first timers looking for a good family outing. The Hawks organization know how to sell the product. Last week Buffalo Sabres d-man Tyler Myers worked out with his former junior team. Myers had the luxury of spending some time in Kelowna for the Olympic break. Snake bitten. That may best describe the Kelowna Rockets woes in the offensive zone in two of three losses on the weekend. After firing 37 shots at the Portland Winterhawk net in a 3-2 loss Saturday, the Rockets upped that total to 43 one night later in a 3-1 loss Sunday to the Seattle Thunderbirds. The Rockets were so desperate to get the tying goal late in the game that they threw Tyson Barrie up front as a forward in an effort to send the game into overtime. In this game, the Rockets power play didn’t really have a chance to flex its muscle. Only one power play was awarded the visitors, ending abruptly after defenceman Antonie Corbin took an interference penalty. The Rockets were technically 0 for 1 while the T-Birds were 0 for 5. The game winning goal is the result of a gaffe by defenceman Tyson Barrie. Barrie has his pocket picked at the left face-off circle by T-Birds leading point getter Prab Rai. Rai quickly spins and fires the puck, beating a startled Mark Guggenberger. While Guggenberger should be ready at all times, it was a rare occurrence to see Barrie stripped off the puck in a dangerous area around his net. I liked Guggenberger’s play again Sunday night. While he saw no where near the pucks that Seattle counterpart Calvin Pickard did, Guggenberger made a nice save off of T-Birds forward Brenden Silvester, who was awarded a second period penalty shot. Pickard comes up large by stoning Rockets forward Geordie Wudrick on a breakaway chance when the game is still scoreless. Wudrick’s backhand appears to go through Pickard’s legs, but the goaltender gets enough of it to deflect it wide of the far post. Let me do my best Pierre McGwire imitation. Get excited Seattle about Branden Troock. The 15 year-old scored his first WHL goal to open the scoring. Playing on a line with leading scorer Prab Rai and Charles Wells, the three created some great chances in the attacking zone. Troock appears to have good size, see’s the ice well and has a good shot. He’s a synch to make the T-Birds next season. The only fight of the night came when 16 year-old Mitch Elliott dances with 17 year-old Rockets d-man Mitchell Chapman. The 6’5 forward doesn’t fight often but should. An impressive tilt by the former teammate of Rockets forward Brett Bulmer. The loss extended the Rockets losing streak to 4 games (0-3-0-1) while snapping the Birds 17 game losing streak. It’s Seattle’s first regulation win since early January. Know wonder they use nicknames in hockey. Can you imagine what Seattle Thunderbirds coach Rob Sumner would have to go through if he didn’t? The T-Birds have three players with the first name pronounced Bren-dun. There is Brenden Silvester and Brenden Dillion and Brendan Rouse. Now throw into the mix newcomer Branden Troock. 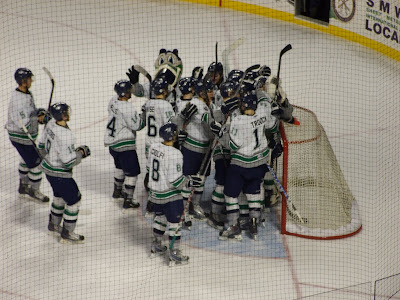 Seattle Thunderbirds snap a 17 game losing streak with a 3-1 win Sunday over the Kelowna Rockets. It's the T-Birds first win since January 9th against Prince George. Why are the Portland Winterhawks so good? 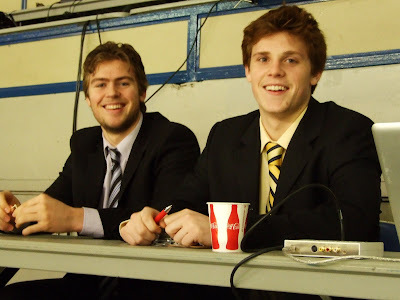 Dallas Jackson (left) and Evan Bloodoff (right) watch the game from the press box in Portland. Both are sidelined with injuries. 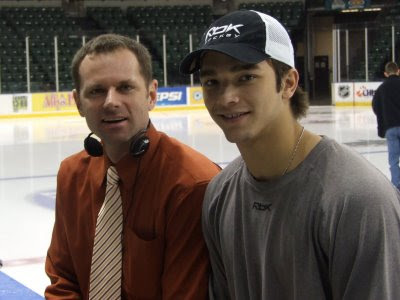 Scooter Vrooman and his son Todd make WHL history Saturday night as the father-son duo broadcast the Hawks-Rockets game. When you have an opponent by the throat, don’t give them any chance to breath. The Kelowna Rockets let that happen against the Portland Winterhawks Saturday night at Memorial Coliseum. With a 2-1 lead late into the third period, the Hawks scored two goals in a span of a minute and 25 seconds, in a 3-2 come-from behind win. Essentially the Rockets were just over 5 minutes away from earning two points and recording their 30th win of the season. The loss was just the third this season for the Rockets when leading after 40 minutes. Where has the power play gone? A threat to score in January has now dried up in February. The Rockets are just 3 for 25 (12%) in their last five games. The Rockets were 0 for 5 against the Hawks. Conversely, Portland’s lone power play goal ties the game with just over 5 minutes remaining in regulation time. The Rockets failed to score a power play goal against the Hawks in the seasonal series. Overall the Rockets were 0 for 14 with the man advantage and were 0-3-0-1 in the four games. Adam Brown was solid in goal and was full marks for third star status. Brown made 36 saves on the night and was steady throughout. With Brown’s performance Saturday and Mark Guggenberger’s effort Friday night, the coaching staff can’t go wrong with playing either guy Sunday against Seattle. Looking for courage and a scoring punch? Look no further than to 17 year-old Brett Bulmer. Bulmer doesn’t score, but gets involved with a third period fight with Oliver Gabriel. Bulmer now has three fighting majors in five games. These days Bulmer is just looking at getting involved in some way for the betterment of the team. Forward Spencer Main is hurt early in the first period and doesn’t return. The Rockets clinch a playoff spot despite the loss. Seattle losses 4-2 to Everett, officially sending Kelowna to the second season. Do you remember Joe Suderman? Suderman is at chiropractic school in Portland and came out to watch his old team play. Suderman played 164 games with the Rockets from 1998-2001 before being traded to Prince Albert. Suderman is an old teammate of Rockets assistant coach Ryan Cuthbert. Eighteen year-old forward Cody Chikie suffered a broken collarbone in last night's loss to Calgary. Chikie will be out no less than a month with the injury. The rookie forward surprised many this season scoring 18 goals. The Calgary Hitmen are a good team. The Kelowna Rockets, much like the sixty-two hundred strong at Prospera Place, watched the Central Division leaders perform their magic Friday night. With just a handful of players rising to the occasion, the Rockets fell 4-1 to the Hitmen, who won for the 22nd time on opposition ice this season. Head coach Ryan Huska pointed to just three forwards that showed some moxy in his team’s 27th loss of the season. Brett Bulmer, Max Adolph and Geordie Wudrick showed some jump, but outside of that, it was slim pickings. The coach didn’t name names, but was disappointed with the urgency level of some of his veteran players. Despite a lack of urgency, it’s amazing that the Rockets were a goal post away from tying the game in the third period. Forward Brandon McMillan rings one off the post when the game is 2-1. Moments later the Hitmen score to make it a 3-1 game. Who was the most dangerous player on the ice? Brandon Kozun. Man, I love the way he plays. Up tempo all the time. The little man is held off the score sheet but creates some good things. The 19 year-old had a gift wrapped breakaway that has him firing the puck wide of the net. How good has Kozun been over the last two seasons? Do you remember how I was pumping Colin Long’s tires last season for a combined 190 points over two seasons? Kozun has 193 points – and counting – if you take last years point total and this year’s offensive outburst into account. Both teams play this game without a key defenceman. Twenty-year-old Dallas Jackson missed his 6th straight game with an ankle injury while Calgary doesn’t dress 19 year-old Michael Stone. Stone has a foot problem. Rookie Max Adolph gets positive press for a fight with Hitmen forward Cody Beach. Beach is not only 5 inches taller, but has no less than 15 fighting majors more than Adolph. The two tango in the third period. Beach now has 17 fighting majors. Adolph has a whopping two! I liked the play of goaltender Mark Guggenberger. Making his first start since February 5th, the 21 year-old was especially sharp during a 4 minute power play the Hitmen were awarded after forward Geordie Wudrick is assessed a double minor for high sticking. Guggenberger was quick down low, used his big body to perfection and just played a steady game. While he didn’t pick up a star in the building, he was the third star on our broadcast. The Rockets lost forward Cody Chikie, who was sent to hospital after what appeared to be a clean hit. Chikie did not travel with the team to Portland, which tells you it’s more than just a bruise. The game features two brothers squaring off against each other. Kyle Aschim (Hitmen) meets his younger brother Sean (Rockets). The loss has the Rockets leading 7th place Kamloops by just one point and 8th place Chilliwack by three. Both the Blazers and Bruins are winners on Friday. It was nice to see a good contingent of Hitmen fans at Friday’s game. They have a lot to cheer about as they see their team win a regular season game in Prospera Place for the first time since 2005. Tonight’s Preview The Rockets have points in 12 of their last 13 games (11-1-0-1) heading into tonight’s game against the Hitmen. The Rockets have only been out-shot once in their last 12 games. This is the first of three games in three nights for the Rockets, who travel to Portland Saturday night before ended the weekend Sunday in Seattle. The Rockets then leave for an Alberta road trip on Tuesday where they will play games in Lethbridge (Wed), Edmonton (Fri) and Calgary (Sat). Overall the Rockets will play six games in the next nine nights to conclude the month of February. Against the Hitmen: These two teams met on October 28th at Prospera Place, with the Rockets earning a 4-1 win. The Rockets scored twice in the first period and twice in the third period in the victory. Stepan Novotny, no longer with the team, scored twice in the win while Lucas Bloodoff chipped in with two assists. Brett Bulmer and Cody Chikie also scored goals in the win while Adam Brown made 35 saves in the victory, including a penalty shot awarded to Hitmen forward Joel Broda in the first period. The Rockets were 2/8 on the power play while the Hitmen were 0 for 5. Last Game Recap: Mitchell Callahan, Brett Bulmer and Antoine Corbin scored in a 4-3 shootout loss last Saturday to the Kamloops Blazers. The Rockets had a 3-1 lead eight minutes into the second period before the Blazers rallied back. Adam Brown was tagged with the loss in goal, making 22 saves. The Rockets fired 37 shots at the Blazers net, including 16 in the second period. The Rockets were 2 for 6 on the power play while the Blazers were 2/2. Who’s Hot – Who’s Not: Tyson Barrie has four points (1+3=4) in his last six games….Brandon McMillan has 2+6=8 in his last six games….McMillan is one point shy of 150 for his career….Geordie Wudrick has four goals in his last six games….The Rockets have opened the scoring in eleven of the last sixteen games…Barrie has 125 career assists….Mitchell Callahan has goals in back-to-back games…Adam Brown has started eleven of the teams last thirteen games.…Brett Bulmer has points in five of his last six games (1+6=7) and snapped a nine game goal scoring drought Saturday night against the Blazers….Adam Brown is 8-1-0-3 in his last twelve starts…Shane McColgan has points in six of his last eight (4+4=8)…Just eight of McColgan’s 23 goals this season have been scored on home ice. The Rockets have allowed just four power play goal against in their last nine games…Dallas Jackson is missing his 6th game tonight with a ankle injury (he was a game time decision vs. the Hitmen)…A win tonight would give the Rockets 30 victories for the 15th time in franchise history….Dallas Jackson has 3+6=9 in 10 games since being acquired at the trade deadline. Geordie Wudrick has 13+10=23 in 26 games with the Rockets since he was acquired from Swift Current in November….The Rockets have played 15 games since the trade deadline. The Rockets have a point in 13 of those 15 games and are 10-2-0-3 over that period… The Rockets are 5 and 3 in the shootout this season. The Rockets only shootout losses have come against Kamloops, Portland and Chilliwack. Adam Brown was in goal for all three shootout losses…Mark Guggenberger has not started since a February 5th game against Lethbridge…The Hitmen have not won a regular season game in Kelowna since November 4/05 in a 2-1 victory. Brett Carson scored the game winner at the 4:29 mark of the 3rd period on the power play…The Hitmen won game four in Kelowna in last years WHL final (6-2). Game Day Tidbits: The Rockets are 4 and 5 in situations that feature three games in three nights….The Rockets have lost 26 times this season. Last season the Rockets lost just 21 times….Tyson Barrie is tied for the WHL scoring lead by defencemen with 62 points, the same number of points as Kevin Connauton of the Vancouver Giants.…The Rockets have been involved in twenty-six (26) one goal games this season. The Rockets are 14-7-2-3 in those twenty-six games…Tyson Barrie leads the team with 9 power play goals….Tyson Barrie has a team high 48 assists, 8 more than he had all of last season…McColgan is tied for the league lead in points by a rookie with 60, the same as Giants d-man Kevin Connauton….Ryan Huska recorded his 100th regular season victory December 4th against Edmonton…Defenceman Mitchell Chapman and forward Brett Bulmer are rated by NHL Central Scouting for this summers draft in Los Angeles. Chapman is rated 151st while Bulmer is ranked 164th among North American born skaters…The Rockets have 5 home games and 7 road games left for a total of 12. Of those 12 games, 5 are against American based teams and three against BC Division rivals. Four are against Central Division teams… Brandon McMillan collected his 100th career assist vs. Edmonton on February 3rd…The Rockets have eleven players with 10 or more goals. Last season the Rockets had 12 players with 10 or more goals. I will post the interview shortly. If you missed it, Almond made his NHL debut Friday night with the Minnesota Wild. 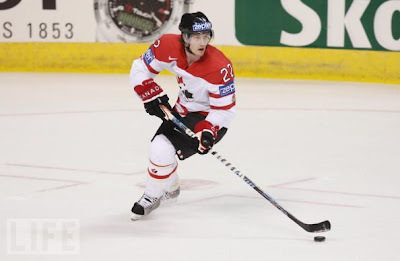 The Kelowna Rockets are well represented at the 2010 Winter Olympics in Vancouver when it comes to men's hockey. Duncan Keith (2003) and Shea Weber (2003-2005) will patrol the Team Canada blue line. 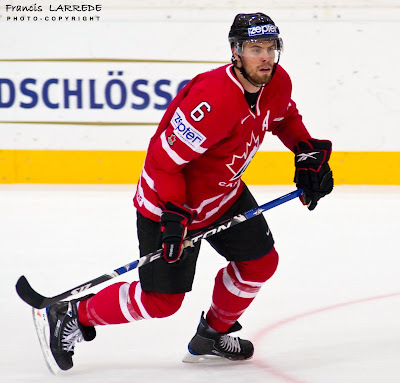 Canada opens the tournament today against Norway. I spoke to Chilliwack Bruins head coach Marc Habscheid, who had the privilege of coaching both of those players in Kelowna. "A credit to him for making the Olympic team. He's done a great job with his career. He was a guy that was good on the power play, was pretty good defensively, but really didn't dominate in one area. I think his real development was through junior and then in the American Hockey League under head coach Trent Yawney. He just kept developing and kept getting better and identified in his game that he is a pretty good defensive player, and that's really carried him." "The thing that Web's always had going for him was his head. He was just a tremendous kid who was gritty and minded his P's and Q's. He came from a strong family. Tough..tough ..tough mentally, and him and Travis Moen are a lot the same. 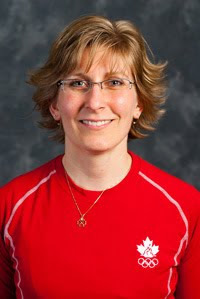 Habscheid also played for Canada at the Calgary Olympics in 1988. Could Shane McColgan and Brett Bulmer evolve into as dynamic a duo as former Kelowna Rockets Colin Long and Jamie Benn? Bulmer and McColgan were born in vastly different environments, with Bulmer hailing from Prince George, BC while McColgan grew up in Hermosa Beach, California. They are separated by close to 28 hundred kilometers geographically, yet both bring a confident swagger that can be backed up on the ice by some impressive offensive statistics. Long and Benn combined for 173 points in their 19 year-old seasons while playing primarily on the same line, so is it inconceivable to think Bulmer and McColgan could match that mark in two seasons if the coaching staff elect to play them together? While McColgan is clearly the best 16 year-old rookie in the Western Conference, let's not overlook Bulmer's accomplishments. Bulmer has the 4th most points of any 17 year-old rookie in the WHL. Only Nino Neiderreitter and Ryan Johansen of the Portland Winterhawks and Medicine Hat's Emerson Etem have more points than Bulmer as a 17 year-old rookie. Neiderreitter and Johansen play on a team that has scored 42 more goals than the Rockets while Etem is with a Tigers team that is only bettered by the Brandon Wheat Kings when it comes to goals scored in the WHL. Speaking of comparisons, is Rockets forward Mitchell Callahan a younger version of former 20 year-old Brady Leavold? Both can score, and both love to get involved physically. Leavold had 27 goals in his final season in the WHL with playing alongside Benn and Long. Callahan already has 19 goals in just his 18 year-old season. The Rockets should learn this weekend if they are officially playoff bound. Seattle remains mathematically alive with 16 games left in the regular season. The T-Birds have 32 possible points available to them while the Rockets have a 26 point lead in the standings. The T-Birds play this afternoon against Vancouver and tomorrow night in Kamloops. The Rockets don't play until Friday, when they host Calgary. When the Rockets meet the T-Birds on Sunday, the game could be meaningless for the home team. Captain Lucas Bloodoff will play in his 250th WHL game Sunday in Seattle. Collin Bowman is 6 games shy of 200 for his career. Dallas Jackson is five points shy of 100 for his career. Goaltender Adam Brown has helped the Rockets earn a point in 11 of his last 12 starts. I can say all I want about Saturday's game, but you can't argue with that result. If it's a bad night for your goalie, it likely won't be a good night for your team. That was the case Saturday night for the Kelowna Rockets and Adam Brown in a 4-3 shootout loss to the visiting Kamloops Blazers. Brown surrendered three goals in regulation, one of which was the tying goal with 22 seconds left in regulation time, and then failed to make a stop in the shootout in the one goal loss. While Brown wasn't the only reason behind the loss, the 18 year-old goaltender has had better nights. A quality save or two would have gone a long way in helping the Rockets earn their 30th win of the season while moving 6 points up on the Blazers for 6th place in the Western Conference. The loss has the Rockets enjoying just a 3 point cushion. Veteran forward CJ Stretch had a solid game for the Blazers, coming up big with three goals in the victory. Stretch beats Brown with a low shot that finds room between the goalies legs and then scores the tying goal with a seeing-eye shot that beats Brown to the blocker. The tying goal comes with Kurtis Mucha on the bench for the extra attacker. The overage forward isn't done there, scoring once in the shootout. It's a good night for the California resident. You have to praise the efforts of Rockets forward Brandon McMillan for playing in pain. After hurting what appeared to be his ankle in Friday's 5-3 win, McMillan gutted this one out and played despite the nagging injury. This game had no where near the intensity we saw Friday night when these two teams collided in Kamloops. After a five fight night, only one bout featuring Rockets forward Tyler Matheson and Blazers d-man Brandon Underwood developed. The Rockets end the seasonal series with the Blazers with a record of 2-5-0-1 in eight games. After going three games without a point, Tyson Barrie collects two assists. It was Barrie's longest pointless streak of the season. Brett Bulmer breaks out of a nine game goal scoring slump with a nice individual effort on the power play in the third period. It was Bulmer's longest goal scoring drought of the season. I would doubt that Olivia Newton-John's smash hit from the 80's 'Let's Get Physical' was being played in the Kelowna Rockets dressing room prior to Friday night's road game, but it must have been the game plan against the Kamloops Blazers. The Rockets were physical right from the drop of the puck until the final whistle, in an impressive 5-3 win at the Interior Savings Centre. The game featured five fighting majors with the fireworks starting after a big hit by Blazers defenceman Ryan Funk on Rockets blueliner Tyson Barrie. More on that later. How many times have you seen this. One team has a great start and the other team scores. The Rockets take the play to the Blazers in the first five minutes, yet the Blazers score on a shot that seems to hit the glass behind goaltender Adam Brown and finds it's way into the back of the net. Despite the goal, the visitors don't let that bother them, scoring twice in the opening frame and generating 19 shots on goal. Blazers goaltender Kurtis Mucha made three nice saves in the opening period, including a penalty shot awarded to Brandon McMillan. McMillan was also robbed on a tremendous blocker save on his off wing before finally scoring on a goal mouth scramble late in the first period to tie the game at two. McMillan would score twice in the win, yet left the game after hurting his ankle late in the second period. As mention, Tyson Barrie gets rocked by a huge hit from Blazers d-man Ryan Funk. Barrie is down before slowly making his way to the bench after athletic therapist Jeff Thorburn looks at him on the ice. Barrie didn't miss a shift. Mitchell Callahan then takes matters into his own hands shortly-there-after by engaging in a fight with Funk, knocking him down with a solid right hand. Funk leaves the game with the help of trainer Colin Robinson and teammate CJ Stretch. Funk appears to land awkwardly on his right leg when falling. What's gotten into rookie Codey Ito? Ito plays his best game of the season by creating a solid forecheck while assisting on the game winner and scoring in the third period. Ito was a bugger to play against and was determined to win battles for pucks rather than be an eager participant. Mark my words, Brett Bulmer is going to be a special player. While Shane McColgan is getting all of the headlines this season as a first year player, Bulmer is going to be a beauty. Bulmer has extremely soft hands which allows him to score goals and set them up. Bulmer picked up three assists Friday night and had a second period tilt with Blazers 16 year-old JC Lipon. Ok, this Jordon DePape kid is a player. Sure, he plays for the Blazers, but how can you not be impressed by this 17 year-old? DePape must have had no less than five or six chances to score. That's a great sign from a player who is going to be huge for the Blazers next season. He has a nose for the net. Rockets goaltender Adam Brown came to play when he needed too. I didn't like the second goal he gave up through his five-hole, but in a 3-3 tie, his best save came off of DePape with a nice glove hand grab. Brown was sharper than he was Wednesday in Everett. He seemed to be overplaying pucks against the Tips, but that was not the case against the Blazers. The opening face-off to the third period was delayed to allow fans at the arena a chance to watch the lighting of the cauldron at the Winter Olympics. The opening ceremony was being broadcast over the video screen on the Interior Savings Centre score clock during the intermission. It almost seemed odd though as the players from each team - officials included - gazed up at the video screen to watch the happenings before play finally resumed after a three minute delay. The Rockets win in Kamloops for the first time this season. In their final visit to the Interior Savings Centre, the Rockets managed just one win in four attempts. Veteran defenceman Dallas Jackson sat this one out with a leg injury. The list has grown to four. That is how many players from last years Kelowna Rockets championship team that will have played no less than one game at the NHL level this season. The most recent player added to that list is 20 year-old Cody Almond, who will make his NHL debut Friday night with the Minnesota Wild. Almond has 10 points (4-6=10) in the last nine games with the Wild's AHL team in Houston. Almond joins Tyler Myers (Buffalo), Mikael Backlund (Calgary) and Jamie Benn (Dallas) that have all played a game in the NHL this season. The 5th round pick of the Wild will be returned to Houston after Sunday's game. When you have no less than three – two-on-ones and don’t score, it usually comes back to bite you. The Rockets should be sporting a huge welt after being bit hard by the Everett Silvertips Wednesday night. 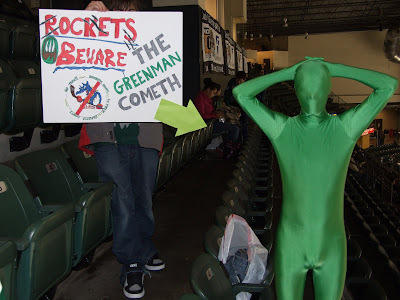 The Rockets failed to score early and the Tips took over, in a 4-0 loss. Had the Rockets scored, we would have had a terrific game on our hands. How tough of a night was it in the offensive zone for the Rockets? How about Spencer Main’s breakaway in the second period that goes for not. Main attempts to go to the backhand, only to lose control as the puck harmlessly is kicked aside by the left pad of Tips goaltender Thomas Heemskerk. Another good example of no puck luck was in the third period on a pretty pass Rockets d-man Tyson Barrie makes from the right boards to teammate Shane McColgan. McColgan is standing alone at the left side of the Tips net, but instead of one timing the puck into the open side, his shot goes wide. The 17 year-old doesn’t miss those very often. Few 23 goal scorer do. Positives? Brett Bulmer’s hustle and determination can’t be ignored. The 17 year-old attempts to jump start his team with a late 2nd period fight. The rookie is playing hard consistently, not sporadically, which makes him a lethal player. Speaking of rookies, Max Adolph showed some jam. A third period fight was the punctuation of a solid effort by a player who you often don’t notice on the ice. An emotionally involved Max Adolph equates into a much better player. The Rockets gave up a power play goal for the first time in 7 games. The game winner at the midway point of the first period was a power play goal. The Rockets played this game without two key players. Dallas Jackson remains out with a leg injury while forward Brandon McMillan remained at the hotel after falling ill Tuesday night on the trip down to Everett. While the Rockets were 1 and 4 against the Tips in the seasonal series, injury and illness played a huge factor in the Rockets lack of seasonal series success. It would have been nice to see what the result would have been had the Rockets iced a healthy team. Maybe my wish will be granted in the first round of the playoffs. Why would I like to see these two teams meet in the opening round? Rivalry. I think the fans of both teams have built up a health dislike for one another over the years thanks to playoff battles in 04 and again in 06. I love the Comcast Arena. They may be cheering against the visitors, but it’s a fun place to be. The travel is also ideal. A five hour trip between the two centers is a breeze. I had to take this pic. And no, I did not ask him to pose that way! Did I get you? Did you think I was trash talking my boy Beach? 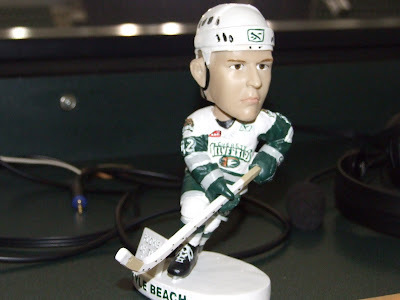 I am sure Kyle Beach has heard many a opposition fan yell out at him things far worse than "Hey Beach, you bobblehead". I understand the first one thousand fans at tonight's game in Everett receive a Kellan Tochkin bobblehead. Evan Bloodoff is practicing with the team, contact included. The 19 year-old forward underwent knee surgery this fall and appears to be on the mend. If everything goes according to plan, Bloodoff could be back in the lineup in three weeks. Tonight's game between the Rockets and Tips could potentially be a playoff preview between these two teams. The Tips are 3rd in the conference while the Rockets are 6th. It translates into a first round meeting if things stay the same. These two teams last met in the third round of the playoffs back in 2003. We all remember what happened in that seven game series. The Tips were down 3 games to one only to win the next three games - all by a single goal. As pointed out by Roddy in the comments section, these two teams also battled in the 2006 playoffs. The Tips advanced in that series too. While the Tips were the heavy underdogs heading into the series in 2003 - the roles would be reversed in 2010. Maybe the Tips coaches have the Rockets pegged as a first round opponent. Why? They were sure watching the Rockets closely go through a pre-game skate this morning at Comcast Arena. It's an unwritten rule that you don't watch the other team skate the day of the game. After seeing the Tips coaches watching from the stands, their goes that theory. Defenceman Dallas Jackson won't play tonight. Jackson is out with a leg injury. Remember when he hobbled off the ice a couple of games ago? Rumours...rumours...rumours. A report of a veteran Rockets player leaving the team are just that - a rumour. Marc Habscheid knows something about the pressure of playing hockey for Canada at the Winter Olympics. 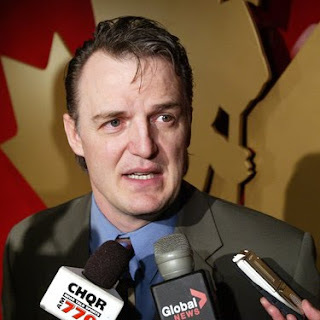 The head coach of the Chilliwack Bruins was a player with Canada's Men's Team at the 1988 Olympics in Calgary. Habscheid wore sweater #14 with Team Canada, coached by Dave King. Habscheid played with the likes of Andy Moog, Shaun Burke, Steve Tambellini, Trent Yawney and Jim Peplinski. The Canadian team finished 4th. I've been informed that when the video monitor asks for crowd noise at Chilliwack Bruins homes games, pumped-in crowd noise is not used. In fact the noise that you hear in the building is indeed - the fans. Robbie Snooks, video director for the Bruins sent an e-mail to straighen me out. I know what you are all saying after reading this blog entry. As can I my friend, as can I. Talk about getting back on track. A solid effort Saturday night in Chilliwack with a 1-0 win over the hometown Bruins. Good energy from all four lines and Adam Brown was solid in goal. I would almost go out on a limb and say it was Brown's best performance of the season. Brown didn't need to be spectacular, but was in control on every shot he faced. I hate when goaltenders overplay pucks and seem to be out of control to make a second save. Brown was square to the puck and made the routine saves look - routine. The lone goal of the game is scored early in the third period, yet I thought the Rockets created some good things in the offensive zone. While Brown was named the games first star, Lucas Gore, the Bruins goaltender, was just as good. The penalty kill continues to impress. With Brett Bulmer in the box for a double minor for high sticking, the penalty killing unit shut the door, as the Bruins attempt to send the game into overtime. The Rockets have not allowed a power play goal against in 6 games. The last team to score a power play against the Rockets was the Seattle Thunderbirds on January 27th. Bulmer receives a double minor for high sticking late in the third period after his stick strikes a Bruins player. Bulmer has no choice but to loose control of his stick after almost getting his head taken off with an open ice hit. A magician, brought in for a second intermission performance, was gathering almost as much attention in the upper concourse during the third period than what was happening on the ice. I am not saying the game lacked entertainment, but it's a sad commentary that a hockey fan in Chilliwack pays good money to watch junior hockey and then is more interested in a magician doing a slight of hand trick, rather than watching two teams involved in a one goal game. I thought it was a classy move by the Bruins organization when they dedicated a moment of silence in memory of Brendan Burke. The 21 year-old is the son of Leafs GM Brian Burke, died tragically in a car accident Friday night. Burke is a co-owner of the Chilliwack Bruins. I was given a black ribbon by the Bruins organization before the game that I wore on my suit jacket in memory of Burke. The win was the Rockets 9th straight. When was the last time this team won 9 in a row? It was during the 2005-2006 season when the team won 10 straight from October 2nd to November 21st. It started with a win over Everett and ended with a shootout loss to the Vancouver Giants. A day up at Silver Star on Sunday is the reason for the late post. No one was thinking hockey on Sunday were they? Everyone was tuned into the Super Bowl, minus me. Solid 1-0 win in Chilliwack tonight. A moment of silence will be held for Brendan Burke, the son of Toronto general manager Brian Burke who the died in a car accident, before the Kelowna Rockets road game against the Chilliwack Bruins. The 21-year-old Burke died after his car slid sideways into the path of another car on a snowy Indiana road on Friday. Brian Burke is a co-owner of the Chillwack Bruins hockey club. Here is my conversation before the game with Bruins co-owner Darryl Porter and friend of Brian Burke. Porter is expected to attend the funeral on Tuesday. It's not often you leave Prospera Place after a Rockets win feeling so....confused. Confused because of the teams lack of jump, energy and effort. The Rockets won for the 8th straight time Friday night - which is well and good - but the home team was so hospitable that they were almost willing to give the visiting Lethbridge Hurricanes an opportunity to snap a six game losing streak. This one was too close for comfort in a 3-2 victory. For the second straight night forward Geordie Wudrick scored the game winning goal after a third period goal mouth scramble. Lucas Bloodoff took two whacks at it, only to be denied by the left pad of Canes goaltender Linden Rowat. Wudrick also jammed away at it before somehow getting the puck over the goal line to give the Rockets a 3-2 lead. Wudrick's goal came with just over 5 minutes left in the third period. One of the bright spots for the Hurricanes was goaltender Linden Rowat. Rowat made 43 saves including 19 in the first period. The 20 year-old goaltender wasn't the only reason why the Hurricanes had a chance to end the Rockets winning streak, but Rowat gave his club a good chance of getting into the win column for the first time in seven games. Rowat was consistently the best player on the ice. I also liked the play of Hurricanes defenceman Brennan Yadlowski. Yadlowski logged a ton of ice time and was steady in his own zone. The Hurricanes played this game with just 15 skaters, three under the league limit. They worked hard under tough circumstances. The Rockets were without defenceman Dallas Jackson, who is sidelined with a leg injury. The Hurricanes will feel like world beaters after this game, especially after being destroyed in back-to-back losses to Chilliwack and Vancouver. While the one goal loss will feel like a triumph, in reality, the Rockets were just that bad. Sorry Hurricane fans, but the truth sometimes hurts. Am I too critical? Maybe. But I've seen this team play at an extremely high level. I realize they can't preform at an optimum level every night, but what we saw Friday is well below the standards of even an average night for this team. Mark Guggenberger came within inches of doing something goaltenders rarely do...score a goal. With the Hurricanes net empty for the extra attacker, Guggenberger found the puck on his stick, saw no pressure around him and elected to lift the puck all the way down the ice. The puck would eventually hit the outside of the post resulting in an icing call and a faceoff inside the Rockets zone. I don't mind the goaltender attempting for the empty net goal, but in a one goal game is it a wise decision? The play creates a key faceoff, enabling the visitors another chance to tie the game. If Guggenberger scores, we don't have this conversation. Two big hits in this one, one comical , the other bone crushing. The comical hit came when forward Lucas Bloodoff was hit in front of the Rockets bench. The momentum has Bloodoff making contact with teammate Codey Ito on the bench. Ito ends up losing his balance and tumbling over the bench, landing on his rear end. Rockets assistant coach Dan Lambert had a good chuckle as he had a front row seat to the tumble. The crowd also let out a laugh after seeing the domino affect on video replay. Rockets rookie Brett Bulmer had a nice open ice hit on Jacob Berglund at the Hurricanes blue line that sent the European forward flying. Props to Berglund for staying in the game. The win moves the Rockets two points up on Kamloops for 6th place in the Western Conference. The Rockets remain 8 points back of 5th place Spokane. Tonight’s Preview: Despite playing 55 games this season, the Kelowna Rockets will meet the Lethbridge Hurricanes twice in the final 17 games of the regular season. These two teams will battle tonight at Prospera Place before the Rockets return the favour February 24th. Overall the Rockets enter tonight’s game having won seven straight, having out-scored the opposition 32-15. That translates into 4.6 goals scored per game while giving up just 2.1 goals against during the streak. Following tonight’s game the Rockets are in Chilliwack tomorrow night before traveling to Everett Wednesday. The Rockets are 13 for 39 on the power play during the seven games (33.3%). This seven game winning streak is just one win shy of the 8 game winning streak the team had at the end of last season. The Rockets have averaged 36.7 shots on goal per game during the winning streak. Only once (Med Hat) have the Rockets been out-shot during the streak. Last Game Recap: Geordie Wudrick scored twice in regulation time and then scored the shootout game winning goal in a 5-4 victory Wednesday over Edmonton. Shane McColgan and Lucas Bloodoff also scored goals for the Rockets, who were 2 for 4 on the power play. Adam Brown earned the win in goal. Who’s Hot – Who’s Not: Tyson Barrie is riding a seven game point streak (5+7=12)…Brandon McMillan has 3+9=12 in his last seven games….Geordie Wudrick has 4+5=9 in his last six games….The Rockets have opened the scoring in nine of the last eleven games…Tyson Barrie has points in 36 of his last 42 games. Barrie has 123 career assists….Mitchell Callahan has six points in his last seven games. Callahan has 4+2=6.…Adam Brown has started seven of the teams last eight games.…Brett Bulmer has 8 points in his last ten games…Adam Brown is 6-0-0-2 in his last eight starts…Shane McColgan has points in 9 of his last 10 games. McColgan has 5+10=15 over that period…The Rockets have scored a short handed goal in three of their last four games…Just seven of McColgan’s 22 goals this season have been scored on home ice. In other words, 68 percent of the rookie’s goals are scored on the road. Ryan Nugent-Hopkins of the Red Deer Rebels, the top 16 year-old scorer in the Eastern Conference, has scored 9 of his 19 goals on the road (47%)…The Rockets have not allowed a power play goal in four games. 19 for 19 kills over that period. D.J and Wudy: Dallas Jackson has 3+6=9 in 10 games since being acquired at the trade deadline. Geordie Wudrick has 11+9=20 in 21 games with the Rockets since he was acquired from Swift Current in November. The Rockets have played 10 games since the trade deadline. The Rockets have a point in 9 of those 10 games and are 7-1-0-2 over that period. The only regulation loss has been a one goal setback to Red Deer (4-3) back on January 16th. Take Me to the Shootout: The Rockets are 5 and 2 in the shootout this season after a 5-4 victory Wednesday over Edmonton. The Rockets only shootout losses have come against Portland and Chilliwack. Game Day Tidbits: The Rockets own the 2nd best power play at home in the WHL (28.5%). Only Calgary is slightly better at 28.6%....Tyson Barrie is the WHL Player of the Week. Barrie had 4+4=8 in four wins last week… The Rockets enter tonight’s game having won 4 straight games at home and 3 straight on the road….The Rockets are 4 and 5 in situations that feature three games in three nights….The Rockets registered a season high 52 shots last Friday night in a 4-3 shoot-out win over the Cougars….The Rockets have lost 25 times this season. Last season the Rockets lost just 21 times….Tyson Barrie is tied for the league lead in points by a WHL defencemen. Barrie shares the lead with Kevin Connauton of the Vancouver Giants.…The Rockets have been involved in twenty-three (23) one goal games this season. The Rockets are 12-7-2-2 in those twenty-three games…Dallas Jackson, Shane McColgan and Tyson Barrie lead the team with 8 power play goals apiece….Tyson Barrie has a team high 46 assists, 6 more than he had all of last season…McColgan is one point back of the Giants Kevin Connauton for the WHL scoring lead by rookies…Ryan Huska recorded his 100th regular season victory December 4th against Edmonton…Defenceman Mitchell Chapman and forward Brett Bulmer are rated by NHL Central Scouting for this summers draft in Los Angeles. Chapman is rated 151st while Bulmer is ranked 164th among North American born skaters…The Rockets have 7 home games and 10 road games left for a total of 17. Of those 17 games, 6 are against American and BC based teams with five against Central Division teams… Brandon McMillan collected his 100th career assist Wednesday against Edmonton…The Rockets have eleven players with 10 or more goals. Last season the Rockets had 12 players with 10 or more goals.